Anne-Mary McLoughlin (right) and Annette McFallane with Pollinator Link sign. Saturday morning and I’m listening to Annette McFarlane’s Gardening Tips on 612 ABC Saturday Breakfast, while I make breakfast. 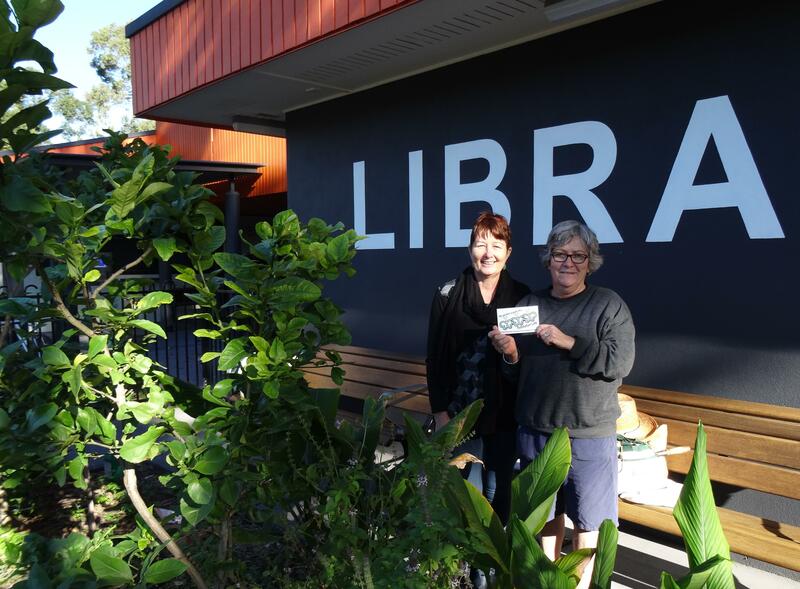 At the end of the segment Annette tells Katrina she is heading for Mitchelton Library to meet with the MOGI team: Mitchelton Organic Gardners. 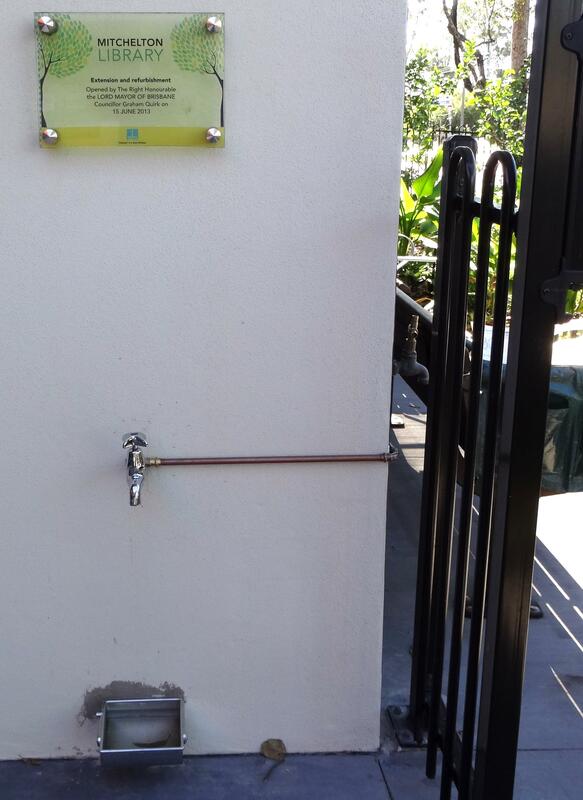 Water for dogs and birds! As this is our first Community Garden registration, I obviously needed to deliver the Pollinator Link welcome pack in person, meet Successful Gardening’s Annette McFarlane and the MOGI team. shelter and places to raise young. Water for dogs turned out to also be water for birds. 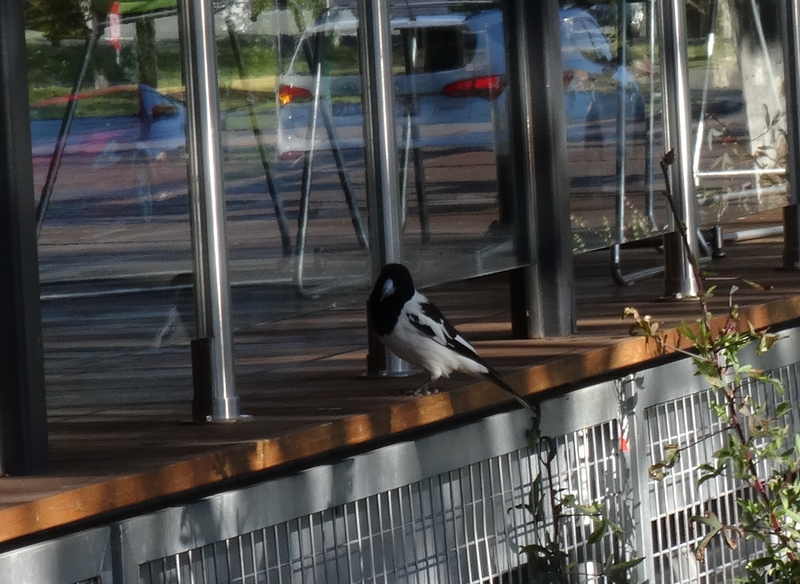 The MOGI team often see Pied Butcher Birds Cracticus nigrogularis sharing the dog drinking bowl at the garden entry. The garden includes a variety of herbs and other plants providing nectar, pollen, berries, seed and, of course, citrus trees – a favourite of the spectacular Orchard Swallowtail Butterfly Papilio aegeus. Ask Anne-Mary to show you her photos of the butterfly life-cycle from caterpillar to butterfly. Shelter for wildlife comes in the form of mature trees, dense shrubs and ground covers. One unexpected source of shelter is the security mesh under the Library coffee shop. It will be interesting to see if small birds use this space – security for equipment may also become security for wildlife. This beautiful garden space certainly ticks the boxes for wildlife. It is also becoming an interesting community resource with commuters nipping our of their cars to collect some herbs for dinner. 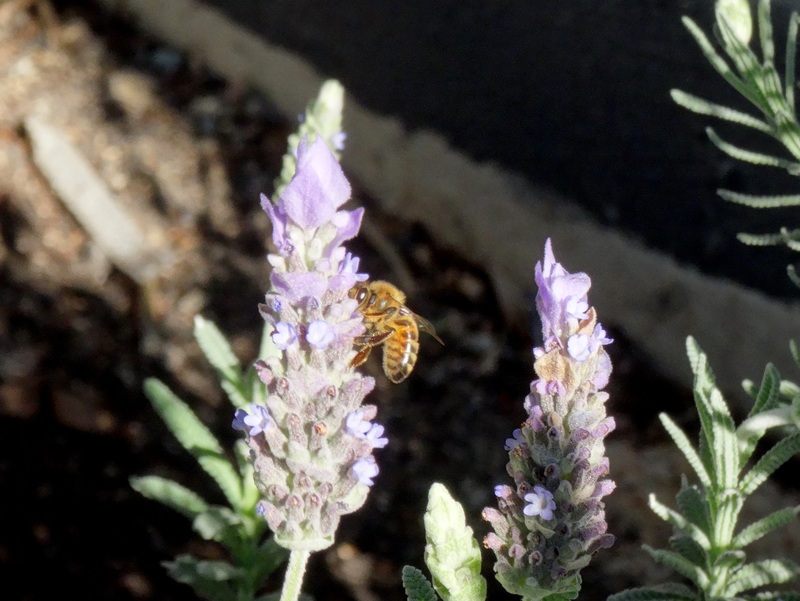 However, the really exciting thing was observing how library visitors also stopped to visit the garden. MOGI team member Sandra took great pleasure in showing Amy and Zoe how to load plant material into the innovative in-ground composters: take an off-cut of PVC pipe, drill holes in the sides, bury in the garden and cover with a plant saucer, simple. Max settled for watching Sandra chop the herbs ready for composting. Sandra also showed some of the healthy earth worms coming from the composters. The children’s mother, Leanne, loved the garden space and the warm welcome, particularly for the kids. Leanne explained that Amy had discovered the garden with a friend and then bought the whole family along for a visit. I love libraries and my (grown) children always loved visiting the library on Saturday mornings. They would have loved this amazing BCC Library and the kid friendly MOGI team members. It was an honour to meet the MOGI team and welcome them to our Pollinator Link project. This entry was posted in Bees, Pollinator Link, Wildlife Corridor and tagged Anne-Mary McLoughlin, Annette McFarlane's Gardening Tips, BCC Mitchelton Library, butterfly life-cycle, DIY in-garden composter, Mitchelton Library, MOGI Mitchelton Organic Gardners, Orchard Swallowtail Butterfly Papilio aegeus, Pied Butcher Birds Cracticus nigrogularis, water for wildlife, worms. Bookmark the permalink.